Confession…I LOVE pie! I love pie more than cake, candy, pastries, cookies or any other dessert! I think for me it’s not only because it tastes good but because I grew up eating a lot of pie! It seems to me that my grandma, who lived with us when I was little, was baking pies every week...I could be wrong but I know she made them at least every other week! I think pie is my ultimate comfort food because of that. I think I’m not alone in thinking this either. I asked a few people if they had a choice of cake or pie what would they choose and a lot of people said pie! 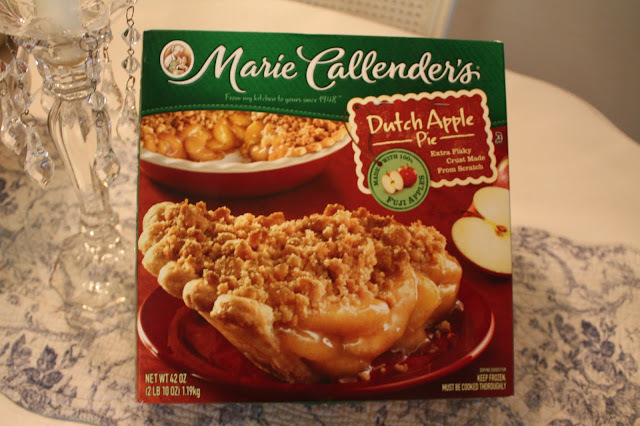 When I got the opportunity from BlogHer and the people at Marie Callender’s to try their Dutch Apple pie I couldn’t resist. They told me that their pies are made from a scratch crust, are wholesome and with a homemade quality. Honestly, I didn’t expect to love it as much as I did! Just baking it was great! My place smelled amazing! There is nothing better than the smell of apple and spices filling your home this time of year! I’ve tried apple pies from my grocery store bakeries in the past and I wasn’t impressed. The apples were hard and there wasn’t much flavor. I was really amazed with the Marie Callendar’s Dutch Apple Pie, the apples were cooked perfectly, it was sweet just like I like it and I could taste all the wonderful cinnamon and apple pie spices. Seriously, I did not expect it to taste so good! I served mine with some vanilla ice cream and my secret is to add a little freshly-grated nutmeg on top of the ice cream. If you haven’t tried fresh nutmeg you must! It adds so much. This is what a nutmeg grater looks like if you haven’t seen one. 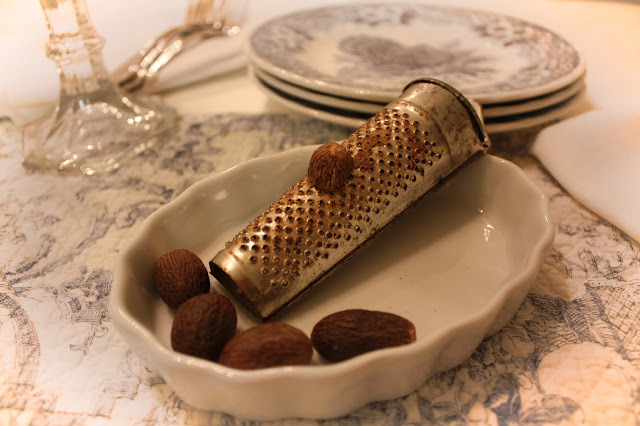 I have a funny story about freshly-grated nutmeg. When my daughter was young and at a home day care I went to pick her up one day and her day care provider said “I have to ask you something”. I was a little worried and then she said “What is fresh nutmeg?” I laughed…my daughter was a foodie at 6 years old. Her babysitter gave her some eggnog and my daughter had asked her for fresh nutmeg on it! The baby sitter only knew of the stuff in the jar! To me that has no flavor! Fresh nutmeg on vanilla ice cream on top of apple pie is the best!!! I now plan to have some of these on hand in my freezer because it’s always good to have something on hand to serve unexpected guests when they arrive. 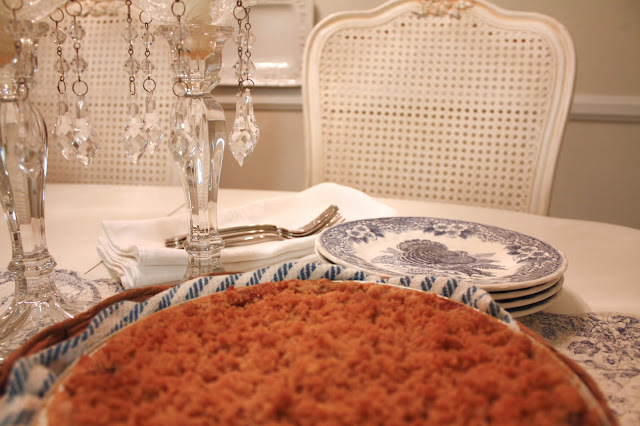 The Dutch Apple is 100% Fresh Fuji Apples, Made-from-Scratch Crust, Brown Sugar Streusel, Baked to Perfection! There is nothing better than the smell of apple pie baking in the oven…again that just brings me back to my childhood! Now for a chance to win a $100 Visa gift card, tell me in the comments below, what family quality time could you do with your family while enjoying a Marie Callender's pie? We could enjoy my husband's birthday with pie. We could play board games while enjoying pie. Good pie and conversation with our family around the table, what's not to love about that! Eating Razzleberry pie with my Honey is a celebration in itself! That reminds me I need to see if my local grocery store has any in stock yet. Mm, mm. Enjoying a fun game of UNO with the kids would be great to do while eating a slice of pie! That is my favorite "go to" dessert for company. The Dutch Apple and the Razzleberry are my favorites!! Family game and movie night is perfect to enjoy a Marie Callender's pie. I love pie! Apple is a faMILY Favorite but I Love them All. W have a new home and there is nothing better than having everyone over to sit at our table and just enjoy each other. We could watch a family movie while eating pie! My Mom and I would bake one of these while having high tea so of course we had whipped cream to while we watch Agatha Christie mysteries!!!! Being English we melted sharp cheddar cheese on top. Deliciousness abound!!! We would have a pie while taking a break from decorating the tree. Thank you for the giveaway. I would enjoy a pie for my son's birthday this month and have his friends over and serve pie to them at his birthday party! My sister demands Marie Calendar Pumpkin Pie for thanksgiving over my husband's homemade. My Mom, Dad and I would enjoy one of these Dutch Apple pies, sitting and watching PBS Masterpiece together (we love to watch those together; Mom is 80, Dad is 89 and I am... well, never mind about that). And we would enjoy it!! Mmmm! Apple pie! my favorite! I think I would use it for my annual New Years Eve party. I like the idea of pie rather than cake! I would love Apple Pie for the Christmas girls' get together! We could enjoy Marie Callender's pie while playing card games together. We could enjoy the Marie Callender's pie with a cup of tea while playing Scrabble at the kitchen table. Oh, that sounds so good! (delightfulrepast at aol dot com) And the $100 Visa gift card would come in soooo handy for some much-needed home fixes we're tackling. We could play a board game. we always talk about doing a game night, and i'm pretty sure game night goes with pie! These pies would be great for New Years Eve with our family! We could have a fun family game night while enjoying Marie Callender's pie! We would enjoy movie night with the pie as a family. We would enjoy our family movie night with these pies. We celebrate with Maire Callenders pie every holiday. Its the only pre made pies i will buy. 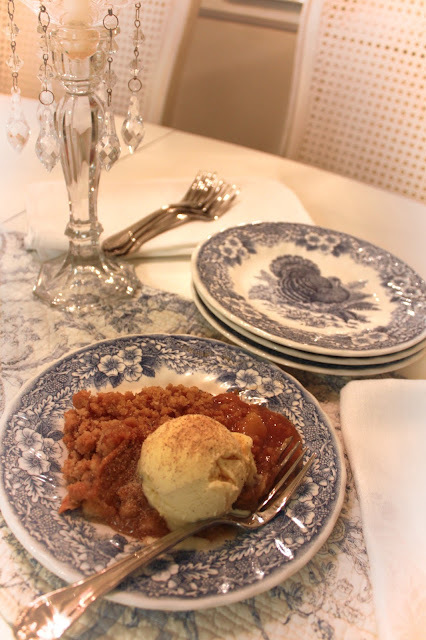 We could enjoy some warm apple pie ala mode during family movie night. We would enjoy eating pie at family game night. We would have a game night and eat pie! I'm sure we'd all enjoy this pie at our upcoming family reunion. Razzleberry is my favorite, though our local store does not carry it. I have to travel over an hour away to find it. Worth the trip though. Smother a luscious slice with cream and I am in heaven! aww, i would love a good game night, taboo is my favorite. Eating this for dessert would definitely put a smile on our faces! Perfect Segway to game night!! Celebrating the birth of my Great Niece!! PS We love Marie Callender's ready made pie dough and use it all the time!! Enjoyed your post! There is N OTHING more comforting than pie! Marie Calenders has the best pie ever!! As well as their Chicken Pot Pie! Excellent! I would enjoy having pie and coffe with family and or friends and neighbors just like they did in the good ole days! We would play cards with the kids, they love rummy, while enjoying a Marie Callender's Turtle Pie! I shared on Twitter: https://twitter.com/FireRunner2379/status/689526732420968448. We would love to enjoy pie while playing cards! We would have this on game night. My Mom and I would prepare tea in one of her antique teapots with her homemade pies and watch our favorite movies. We loved to discuss different pies for each holiday and she would tell me the stories of making pies with her Grandma and her Mom. I have their rolling pins and I cherish them. my husband & I could celebrate our birthdays with a Marie Callendar's pie! My husband and I would enjoy pie watching a good movie after a nice Sunday supper. This would be perfect for our next family game night! My kids would enjoy playing games and eating pie for dessert! I would like to enjoy my upcoming birthday with one of these pies. They look scrumptious! We would enjoy movie and game night with the pie as a family. Family movie night is great time for pie. We would enjoy movie night. We enjoy pie and ice cream after little league games. The boys are always starving. I would love to watch the sun set over the pine trees in our neighborhood with my hubby while eating a large slab of peach pie! mmm!!! Definitely we could extend (& celebrate) the much appreciated & precious time we spend around the dinner table as a family by enjoying one of these delicious pies! I'd celebrate Leap Year Day with a Key Lime Pie! Any excuse for a Marie Callender pie! We would have a Marie Callender pie for our Sunday dinner dessert. We are all together for that meal.